Whitewool is an east north east facing ridge with a small bowl at the southern end which can take a more north-easterly direction. It is a smooth slope clear of any obstructions with a shallower incline at the bottom making for comfortable slope landings. The club has restricted this site to Paragliders (PG) only due to release of pressure on Mercury. 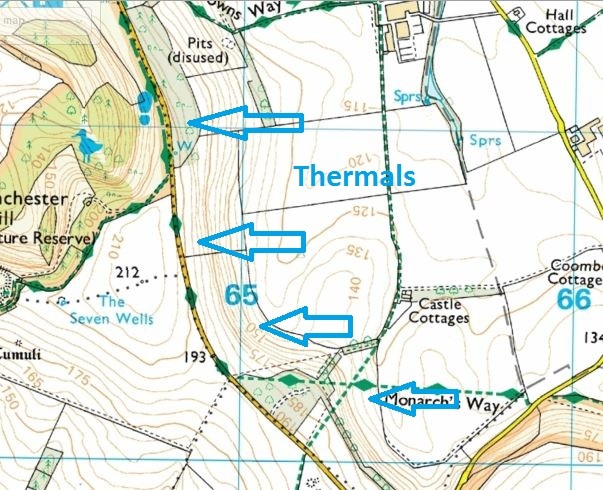 Aero-modellers are not permitted to use this site so the potential for conflict is avoided. ACCESS: Travelling north on the A3(M) from Portsmouth, take the slip road signposted for Clanfield. At the junction, turn left (west) along Chalton Lane. Continue for 1 mile, turn right past Rising Sun Pub on to East Meon Road. Follow the signs to East Meon. 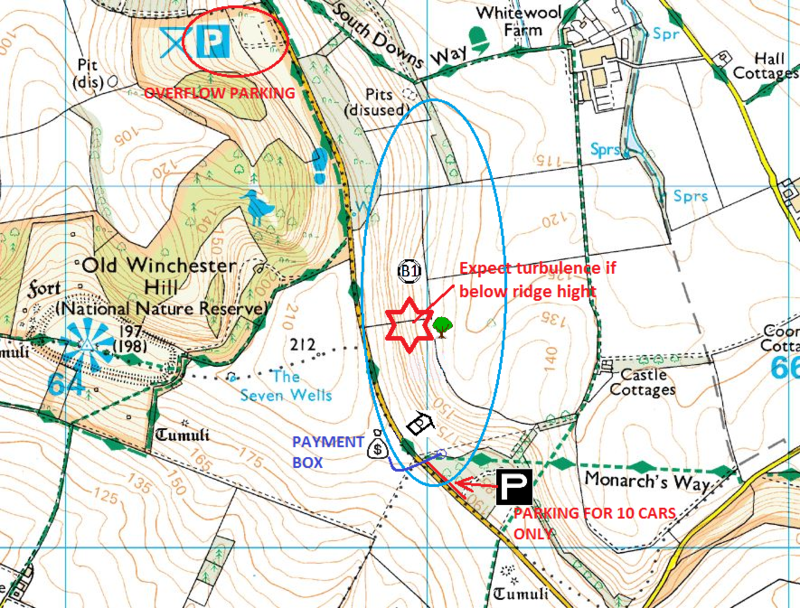 At approximately 3 miles, bear left then right at the junction along Droxford Road, following the signs to Warnford. Continue along past a left turn, a right fork and a crossroads. Three-quarters of a mile past the crossroads, the site is on the right. PARKING: Parking is on the north-east side of the road, on the grass verge to the south of the stile, under the hedgerow. 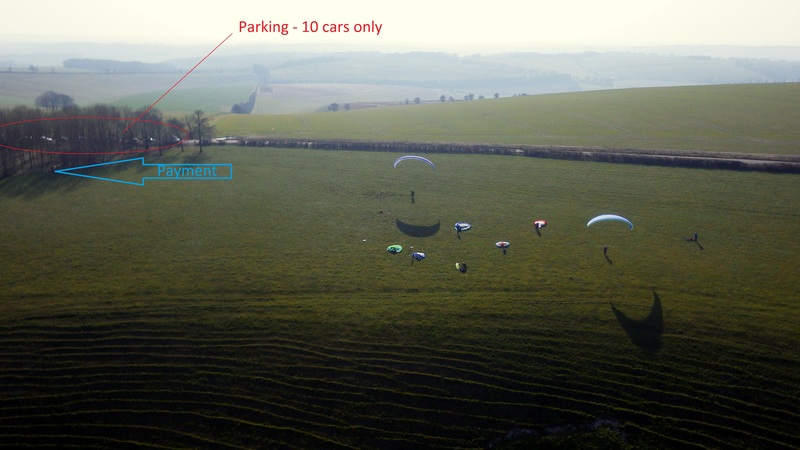 A maximum of 10 cars (which includes any “public” or spectators already there). TAKE OFF: At any point along the slope. LANDING: Bottom landings can be made in the area marked B2 – only in the top half of the field and if NO CATTLE ARE IN EITHER OF THOSE TWO LONG THIN FIELDS. Please slope land if at all possible and stay within the bounds of the main site field. Top landing can be made anywhere within the boundary of the site. Slope landing can be made anywhere within the boundary of the site. HAZARDS: Expect turbulence downwind of the large tree at the bottom of the hill in all wind conditions. Severe turbulence has been experienced in thermic conditions. This site looks harmless but it is not. There have been two serious accidents here in recent years. 1. This is strictly a members only site plus reciprocals. 20 pilots maximum on site. 2. Only 10 cars are to be parked on the east side of the road south of the gate. If activities cause a heavy accumulation of spectators on the road then flying should cease until the road clears. Any public visitor onto the site should be politely advised of the site restrictions / sensitivity and asked to leave. All flying should cease until they do. 3. Pay the £1 site fee in the post on the fence-line down the slope on the right (just around the corner). 4. Dogs are not allowed on site under any circumstances. Livestock will often be in the field. 6. As always – if you are new to the site, please get a site briefing before flying. 7. Do not climb over any fences. This is the most sensitive site we have, it is in full view of the owners and any breach of the rules will cause it to be lost to us. The farmer will claim for any damage. 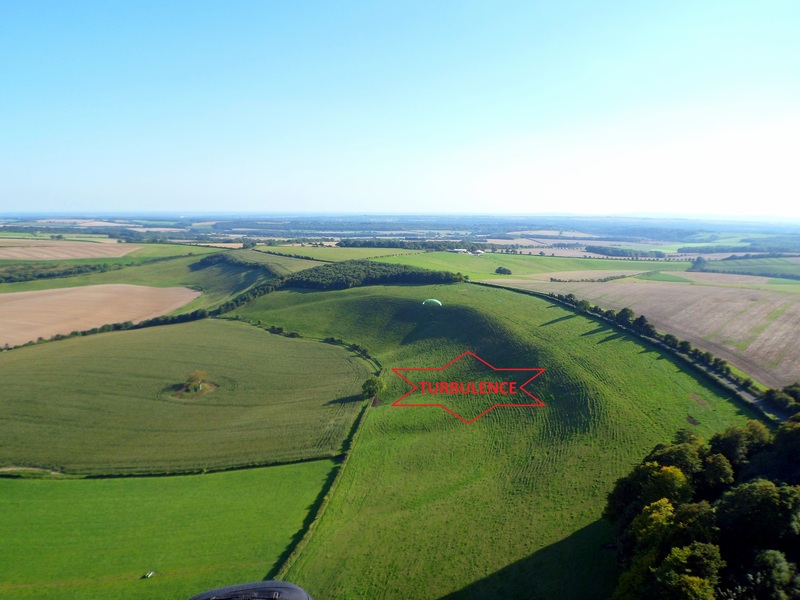 The reverse (western) side of this ridge is owned by English Nature, it is a nature reserve that has banned all forms of recreational flying therefore only contemplate cross country flights if the fields behind launch can be cleared. Car break-in/theft is very common in the area. One good climb will take you into Southampton airspace at 3000ft so you have to have a GPS to stay safe here and set the airspace alarm! There are thermals all over the place and there are reliable house thermals bang in the middle of the ridge as well as at both ends. If you are over the trees to the north of the hill, beware of the deep gully behind you and the higher venturi that can form here. Whitewool is very limited in terms of distance, but to practice breaking the psychological tie to the hill (and your car), it is perfect. Take the first climb till your proximity alarm goes off, then head off downwind under the airspace. 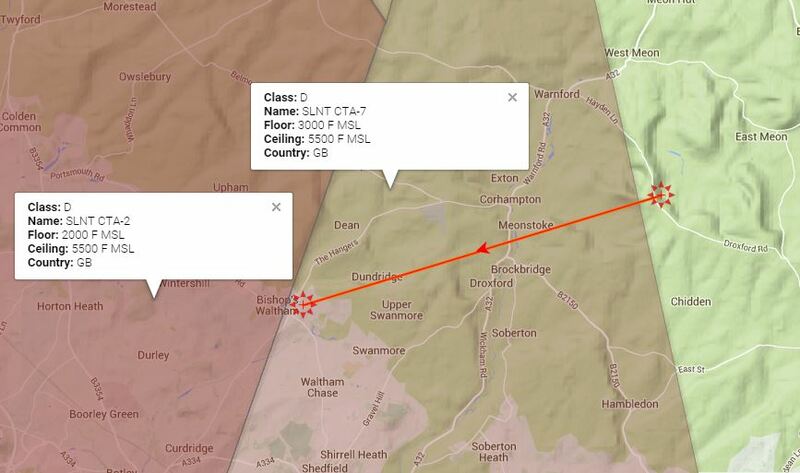 The flight shown below is 10km and you will need a second climb of some sort to reach Bishop’s Waltham. There are a number of un-tapped possibilities from Whitewool and Mercury. One is triangles, which have been done with some success; the other is to clear Southampton airspace. If you can time it right and be flying as the wind shift slightly more to the south, you should be able to cross wind to the north and clear airspace. Before this airspace was here, hang-gliders made it to Wales from nearby Mercury!